Your morning personal-care routine could be causing as much air pollution as rush-hour traffic—and with dangerous consequences for your health. How can that be? When you slather on scented lotion and spray deodorant, perfume and many other personal-care products, you’re filling the air in your home with volatile organic compounds, or VOCs—the same type of harmful chemicals found in many industrial products such as paint. You are, literally, polluting your home as well as the environment. When researchers at University of Colorado at Boulder and various other institutions measured levels of more than 100 different VOCs in the air around Boulder and Toronto during rush hours, they found high levels of decamethykyclepentasiloxane (D5), a chemical commonly added to shampoos, lotions and deodorants to give them a smooth, silky feel. Another study, conducted by researchers at the National Oceanic and Atmospheric Administration (NOAA) and other institutions across the US, found that personal-care products, along with household cleaners, paints and pesticides, now rival motor- vehicle emissions as the top source of urban air pollution. What’s more, our exposure to concentrations of VOCs from these sources are roughly seven times higher indoors than outdoors, says atmospheric chemist Jessica Gilman, PhD, a coauthor of both studies. This may seem shocking, given the fact that we use such small amounts of personal-care products compared with the amount of fuel we use in our vehicles. And yet it also makes sense, since many of these products are specifically designed to evaporate and waft in the air. Regulations that limit vehicle emissions have resulted in lower levels of exhaust pollutants, but without companion regulations on everyday products, the sources responsible for air pollution have shifted. And here’s the scary part: Short-term exposure to some of these VOCs can cause headaches, dizziness, light-headedness, drowsiness, nausea, and eye and respiratory irritation. Long-term exposure has been linked to lung cancer, as well as damage to the lungs, heart, liver, kidneys and central nervous system. Step One: Be a VOC detective. 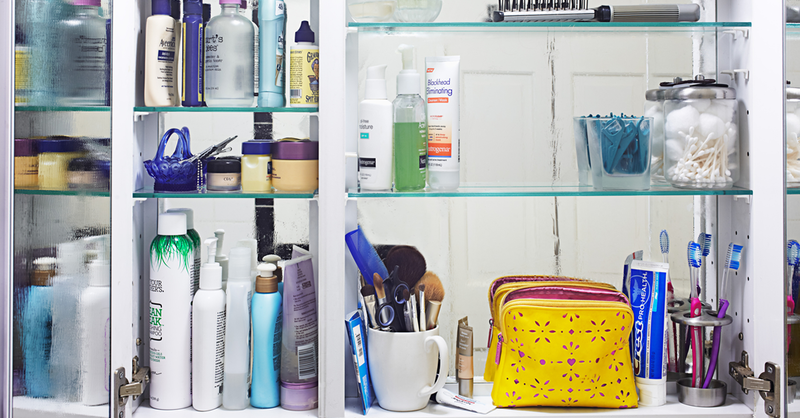 Make a list of all the products in your bathroom drawers and cabinets. Include all of the scented items that you use, from soaps and shampoo to lotions and perfume, as well as items with strong odors, such as rubbing alcohol, nail polish and polish remover, says Gilman. Scent (pleasant or unpleasant) is a sign of VOCs. Step Two: Adapt your use. One simple but powerful strategy is to use the least amount of any product required to get the job done. Do you really need quite as much hair spray, deodorant or conditioner every time you use these products? You will probably find that you don’t. (And as a bonus, using less is a money-saver.) In addition, identify the few scented products with scents you really love…keep using them…but switch to fragrance-free for everything else, says Gilman. And remember: There’s a difference between “fragrance-free” and “unscented.” Fragrance-free means that there are no additional chemicals related to a fragrance. An “unscented” product may actually contain more chemicals, including VOCs, that are added to mask any unpleasant smells from the core product. Step Three: Skip the scented candles. 34% of Americans use scented candles or incense at least once a week, according to Consumer Reports. This means that many of us are literally burning VOCs into the air to “freshen” it—but the result is the opposite: indoor air pollution. Step Four: Read labels before you buy. There are a lot of new products that are advertised as low-VOC or VOC-free. And while these are better options, many still contain VOCs…just less of them. Low-VOC products are permitted to have up to 50 grams per liter and VOC-free, up to 5 grams per liter. Check the packaging or look at the manufacturer’s website for the exact amounts. The EPA list of hazardous air pollutants is also a good guide when looking to avoid certain chemicals, says Gilman. Step Five: Ventilate, ventilate, ventilate. Open a window or door when you’re applying perfume or lotion or painting your nails. If you have a whole house or attic fan, run it to air out your home now and again or use a window air conditioner with the vent control open. Ventilation also helps control humidity in your home, says Jenkins—that’s important because many chemicals off-gas at greater rates in higher humidity. The bottom line: We spend, on average, 90% of our time indoors, so take steps to protect yourself and your family from VOCs.